Den-Con RDS, RD & RDL Rotary Slips are designed for use in 4 taper bowls. The RDS Series has 11" of grip length and is rated at 150 ton. The RD Series has 13 3/4" of grip length for medium depth well and drill string application and is rated at 350 ton. 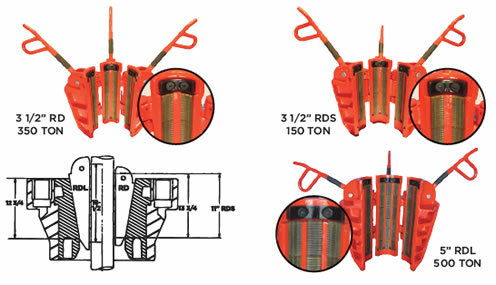 The RDL Series has 16 1/2" of grip length for all deep well and heavy duty string application and is rated at 500 ton. The rugged design of the slip assembly provides a full load distribution throughout the length of the slip and prevents bottle-necking of the drill pipe. All Den-Con rotary drill pipe slips are 4 taper. Den-Con slip inserts interchange with Varco inserts. All slips are standard with flex handles. Steel handles are special order only. PARTS LIST QTY. Part # Weight lb. Part # Weight lb. Part # Weight lb. Part # Weight lb. Part # Weight lb.